HUBER+SUHNER Astrolab is launching the smallest threaded open source connector on the market, the SMPM-T.
Its unique and innovative combination of a MIL-STD-348 SMPM female interface connector together with a retractable threaded nut provides an integrated solution offering unprecedented electrical and mechanical performance. 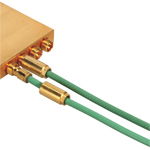 The SMPM-T handles high density requirements with a connector centerline-to-centerline spacing of just 5 mm (0.20 inch) while offering unmatched electrical stability at frequencies up to 67 GHz in even the harshest operating environments. The SMPM-T connector is available along with HUBER+SUHNER Astrolab`s industry driving microbend «bend-to-the-end» technology that is already qualified for any aerospace application. The SMPM-T connector complies with the hi-rel material restrictions of NASA while still offering full compliance with RoHS and REACH legislation in the commercial market.